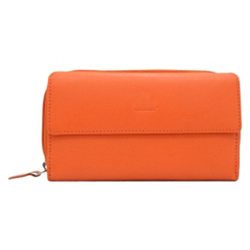 Pamper your loved ones by sending them this Scintillating Urban Forest Ladies Wallet in Orange Made of Genuine Leather exclusively meant to convey your wishes in the best manner. The Wallet has it's own identity to make a difference from the rest. The sensuality of the Wallet creates a soothing effect on the women who are fashion trendy.